China and the United States should promote trade balance by expanding trade volume and pragmatically tackle friction and differences through dialogue and negotiation, Premier Li Keqiang said on March 26. Otherwise, he noted, it will do no good to either country or the international community. Premier Li made the remarks as he spoke to about 100 overseas representatives of Fortune 500 companies, leading research institutions and international organizations as part of the China Development Forum 2018 in Beijing. The three-day forum concluded on March 26. “China’s integration with the world will continue to get deeper,” Premier Li said, expressing his appreciation to those in attendance, who he sees as “passionate about China’s development”. It was through market forces and business rules that trade volume between China and the US has grown to the current level, which, in essence, has benefited both countries, Premier Li said. He said no winner will emerge from a trade war between the US and China. Closing the door to other countries also blocks a country’s own way out, Premier Li said. Noting that 2018 marks the 40th anniversary of China’s State policy of reform and opening-up, Premier Li said this year China will open up further and deepen reform, moves that serve China’s own interest while facilitating healthy international free trade. China is willing to learn about advanced technologies and management expertise from other countries and expand cooperation with them in areas of products, knowledge, technology and services, he said. 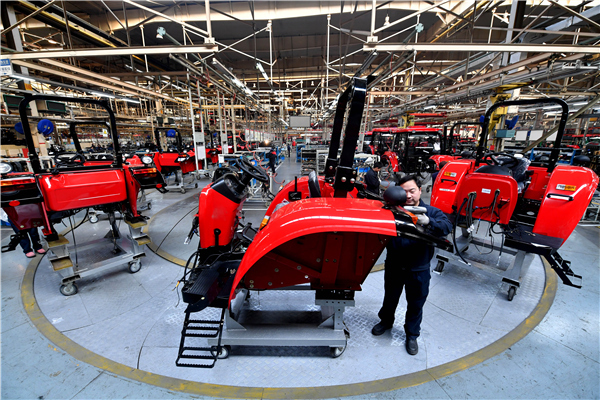 The Made in China 2025 strategy is being promoted in an open and fair environment with equal treatment to domestic and overseas businesses, Premier Li said, adding that China will not force any technology transfer from any foreign company. He said China will enhance efforts to protect intellectual property rights while severely cracking down on infringement, extending his welcome to more globally competitive businesses wishing to share growth opportunities. Representatives at the meeting, including Tim Cook, chief executive of Apple Inc, told the Premier they are willing to participate in China’s reform and opening-up to realize a win-win. General Administration of Customs data show that in 2017, China’s trade volume with the US expanded 15.2 percent to 3.95 trillion yuan ($629 billion), and its trade surplus increased 13 percent year-on-year to 1.87 trillion yuan. Zhang Jianping, a professor at the Chinese Academy of International Trade and Economic Cooperation in the Ministry of Commerce, said China and the US must expand trade volume in general, because the current trade imbalance was not formed overnight and requires structural changes to tackle gradually. Peter Salovey, president of Yale University, said at the forum the key issue between China and the US is to further improve trust and the ability to work together to solve problems. He said he does not want to see a trade deficit “undermine the great work that our countries have done together on different dimensions in the last two decades”.